LA Police Testing Knife Allegedly Found On O.J. Simpson's Old Property : The Two-Way When O.J. Simpson was acquitted of murder in 1995, the absence of the weapon prompted much speculation. Police are now testing a knife allegedly found years ago and kept by a retired police officer. O.J. 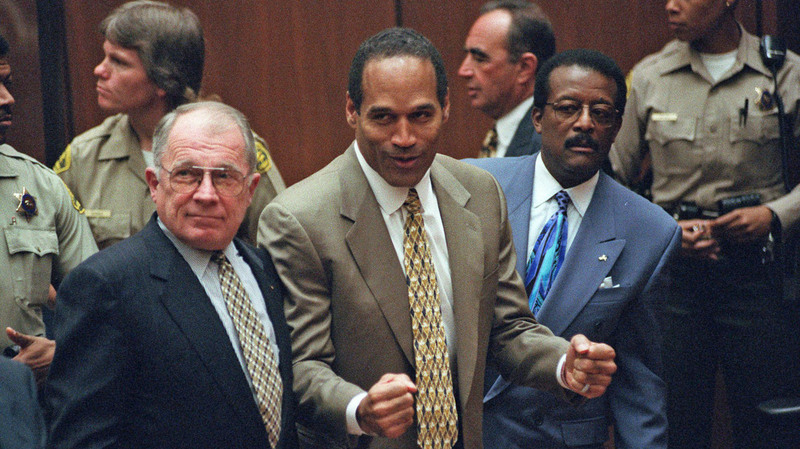 Simpson, flanked by defense attorneys F. Lee Bailey (left) and Johnnie Cochran Jr., reacts as he is found not guilty on Oct. 3, 1995, of murdering his ex-wife Nicole Brown Simpson and her friend Ron Goldman. The Los Angeles Police Department is currently testing a knife that was allegedly discovered years ago at the former home of O.J. Simpson, who was acquitted in the 1994 murders of Nicole Brown Simpson and Ron Goldman. Capt. Andrew Neiman of the LAPD said in a press conference Friday that the knife had been in the possession of a now-retired police officer. The story of the knife's origin is third-hand at best: Neiman says that the retired officer said that he had received it from a civilian who identified himself as a construction worker, and that the civilian said he found the weapon at the Brentwood property formerly owned by O.J. Simpson. The dates of the alleged discovery and the transfer of the knife are not known. The house on that property has been torn down and rebuilt since the trial. "Finding the knife that killed the two had been an obsession of police and others in the wake of the murders. "Authorities searched for the murder weapon for months after the slayings, and there have been many leads that went cold. "A 15-inch knife with a retractable blade that Simpson purchased at Ross Cutlery in downtown Los Angeles briefly tantalized prosecutors in his criminal trial. ... Forensic tests later revealed that the knife was in pristine condition, with no scratches or bloodstains to suggest it had been used in the vicious June 12, 1994, double homicide." The news that a knife may have been discovered at Simpson's former property — which was first reported by TMZ — has, accordingly, fascinated the public. But Neiman repeatedly cautioned that the LAPD has not independently confirmed the retired police officer's story about the knife's origins, noting that the knife could be a "facsimile" or that the account of the knife's discovery could be inaccurate. In the meantime, police are trying to vet the knife's backstory, and will examine it for bodily fluids and hair samples. On the question of whether — if the story of the knife proves true — DNA could be recovered from a knife two decades after the fact, Neiman said: "We're hopeful — if this is involved, our investigators will submit it to the labs that are very good at what they do, and we'll see." Neiman noted that because Simpson was acquitted and no other killer found, the Nicole Brown Simpson murder is currently an open case — and therefore, any evidence would be examined as part of an open investigation. Because of double jeopardy, Neiman said, O.J. Simpson could not be charged with the murders again. He also said he was surprised that a former LAPD officer would withhold evidence from investigators, even if the officer erroneously believed the Simpson case was closed. "I would think that an LAPD officer, if this story is accurate as we are being told, would know that any time you come into contact with evidence that you should and shall submit that to investigators," Neiman said. "I was quite shocked."